The Tea Party movement is alive in Utah. With representatives from FreedomWorks in the audience, delegates at the Utah Republican Convention managed to force Sen. Orrin Hatch into a June 26 primary. He got 59.2 percent of their votes against Dan Liljenquist, a 38-year-old state senator. 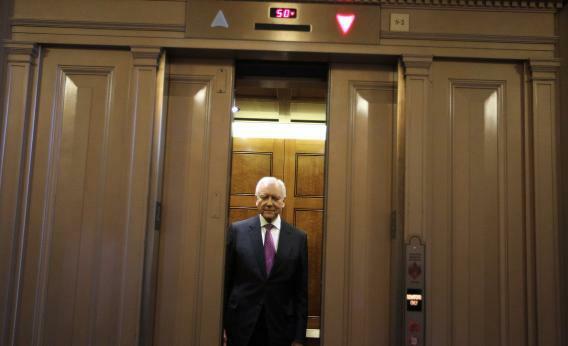 Hatch needed 60 percent to avoid the primary. He couldn’t do it. In two rounds of voting, he went from 2,243 votes to 2,313 votes. If he’d gotten 32 more votes, he would have wrapped this up. Some perspective: Hatch is in a better position than his defeated colleague Bob Bennett was in 2010. The nascent Tea Party went after Bennett hard and early, attacking him for musing credulously about climate change and for co-sponsoring a (going-nowhere) health care reform bill with Sen. Ron Wyden. Bennett got a mere 26 percent of the convention vote, not even coming close to a primary. Hatch made real progress winning over the party’s new activists. Bennett sulked into retirement convinced that he could have won a real Republican primary. Hatch gets to fight this out with some advantage over Liljenquist. How big of an advantage? No clear picture of that yet, but the poll in that link, which tracked delegates, predicted that 63 percent of them would back Hatch. It was 4 points off. Liljenquist was predicting a 50-50 finish. He’s weaker than he thought he was. But not that weak! FreedomWorks and other Tea Party groups now have two Causes to distract them from their failure to replace Mitt Romney with some better candidate – the Senate races in Utah and Indiana.